Baskin, the surreal Turkish horror film, finally hit Netflix instant! This film generated a lot of buzz last year when it hit festivals, so I've been dying to see it! It is directed by Can Evrenol and based on his 2013 short film of the same name (the poster above is actually from his short rather than this full-length feature, but I loved it too much not to use it!). Synopsis: A group of cops responding to a request for backup in an abandoned building stumble upon a portal to hell and inadvertently become part of a horrifying ritual. Baskin creates a nightmarish world where we are sunk into the depths of hell with the characters. While the story itself isn't very developed, the visceral visuals make a jarring impact to keep you on the edge of your seat. There are some creepy moments involving hooded figures lurking in the background, but most of the thrills and chills revolve around gore and blood splatter, plus a small-in-stature-but-large-in-presence character and his unsettling servant (my two favorite characters in the film!). The film obviously has a lot of influences. When the cops are first investigating the seemingly abandoned building, the hunks of raw flesh and chains hanging from the walls and ceilings reminded me of Hellraiser. The creatures that inhabited the netherworld reminded me a bit of the monsters from Jacob's Ladder, Silent Hill, and even the old Italian gorefests. Still, it manages to create something exciting, even if it isn't new. I also liked the whole dreamscape, is-it-real-or-isn't-it premise, which added some extra disorientation to the proceedings. 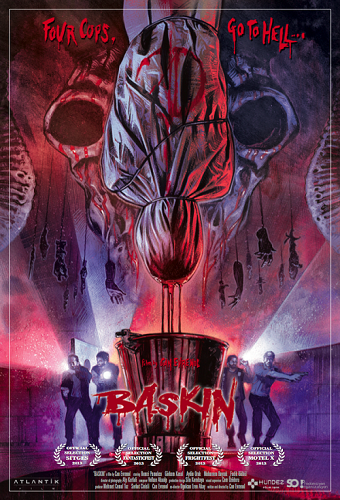 While Baskin doesn't exactly break new ground, I had fun watching it and would recommend others that are into surreal, gory horror flicks check it out, too! You can watch Baskin on Netflix streaming or get it on Amazon! FYI, in English one of the meanings of the Turkish word "baskin" is "descent". Well, well. This looks interesting. I started watching The Hallow, but...it's a bit too unsettling for my fragile mind right now.